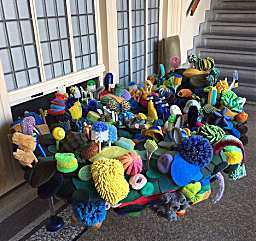 This large sculpture is made from cleaning implements like sponges, scrubbers, scouring pads, mop heads, brushes, plastic gloves and plungers. These were purchased by the artist at many different locations and then attached to a carved piece of sculpture foam. The organic form seems to emerge like a reef from the ocean floor. This miniature "Garden of Eden" is a kind of memorial to the endangered biodiversity of God’s extravagant creation. Vigorously ironic, the artificial organisms suggested by slight manipulation of the consumer products become oddly beautiful when arranged as on a living reef. Among other metaphors attached to the work, it is a call to "clean up" our oceans and protect our reefs.